In what could be a sad commentary on what it is like to be my neighbor, I recently had to ask around to make sure delivering cookies to neighbors didn’t make me look like a weirdo who wants to poison their children or someone who is is looking for an in to start peddling Amway products. The answer was a resounding no from all who responded, so I decided that baking twelve dozen cookies to disperse throughout our new ‘hood was ok, and wouldn’t put me on some neighborhood weirdo watch list. For me, the baking was the easy part. I threw on an apron and set about mixing, chopping, stirring, and finally using my pastry blender for it’s intended purpose. (It really is a handy stand-in for a potato masher.) The hard part was after I filled the tins and cut little parchment paper circles to keep the contents (which hopefully didn’t end up in the trash) fresh. I had to deliver them. 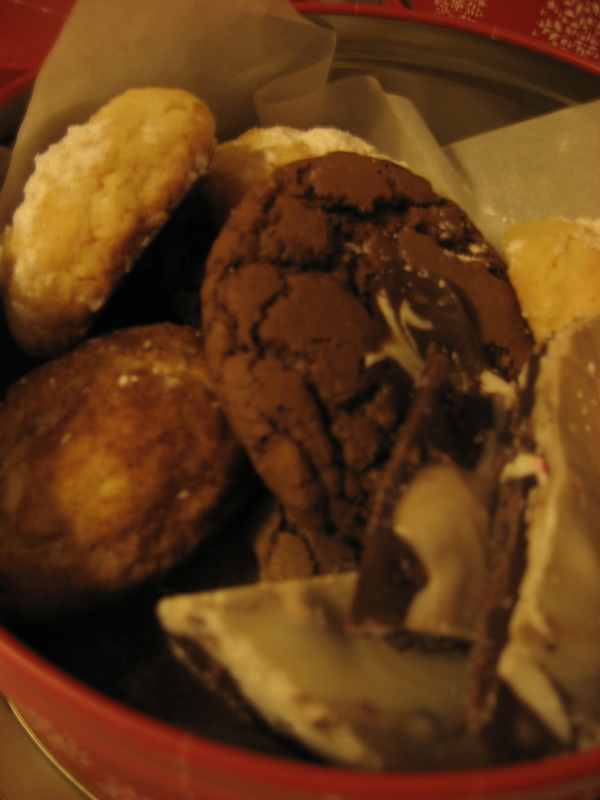 The snow put a damper on car deliveries I had planned to make to close friends – they get cookies, too. And that afternoon the winds were whipping the snow all over up in here. I had never heard of Gooey Butter cookies before, and haven’t really heard much from them since trying them the first time. I guess they are the strong silent type, or since Gooey Butter Cake is a St. Louis thing that may explain it. But I really thought it was an easy, delicious recipe… and perfect for making massive quantities for say a brunch (and yes, I am serving these at our family’s Christmas brunch). I thought it would be fun to pass along the recipe and share the gooey butter lovin’s with all of you who haven’t had the opportunity to dump my cookies in your own trash can. Directions: Beat butter, vanilla, egg & cream cheese until light and fluffy. Mix in dry cake mix. Cover and chill for 30 minutes. Preheat oven to 350. Lightly coat cookie sheet with cooking spray. Form 1 tsp of dough into a ball. Roll in powdered sugar until coated. Bake 12 minutes or until golden. 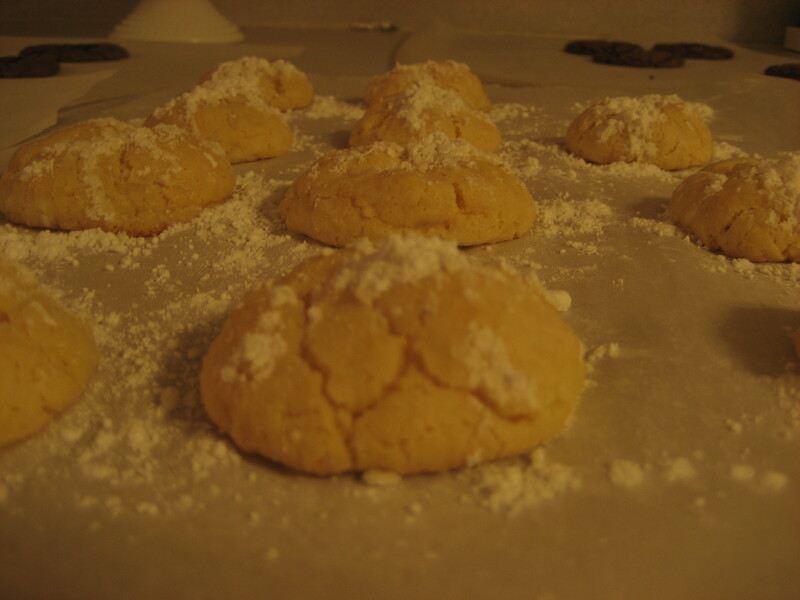 Remove from oven and sprinkle with powdered sugar. Let cool and serve (they are especially good when served cold from the fridge). I would be happy to send along the other recipes if you are interested as well. Just drop me an email! I love gooey butter cookies! 🙂 And I think it is definitely a St. Louis thing. We all love them 🙂 Thanks for the recipe! I’ve never actually made them myself but I am going to try. 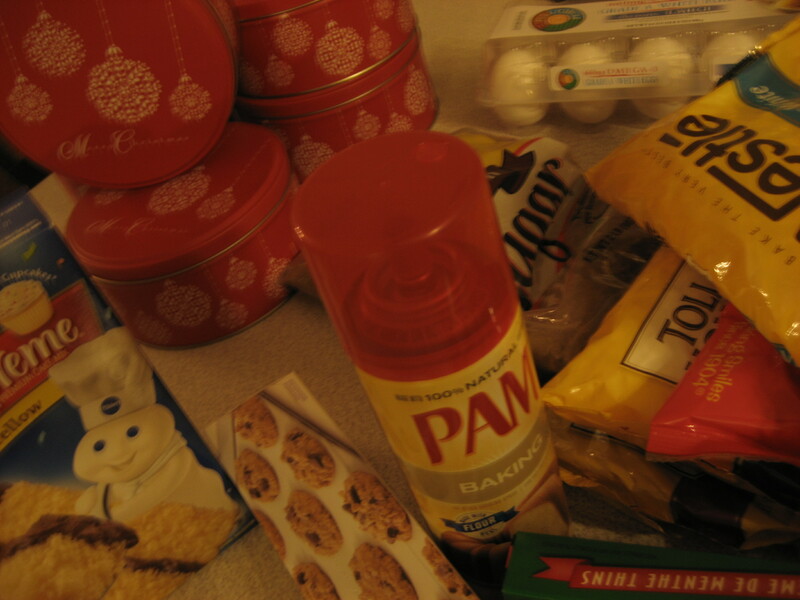 Happy Holidays girly – Gooey Butter cookies were featured in our cookie exchange at work several years ago…good times! I cannot bake to save my life! LOL. Blame my mom who never cooked when I was a kid. But I want to start baking for my kids, homemade stuff, not the pre-made cookies and brownies that I usually buy. These cookies are ooey and gooey in the middle and soft on the outside. It got me thinking Paula Dene has a couple variations to her Gooey Butter Cake so why not do different variations to the cookies. My first batch was slightly gooey on the inside. I flatten them w/my fingers dipped in milk (or you can use a glass bottom) and then sprinkled w/regular sugar (raw sugar or sprinkles would probably do better). They turned out so great that I had to hide them from myself!